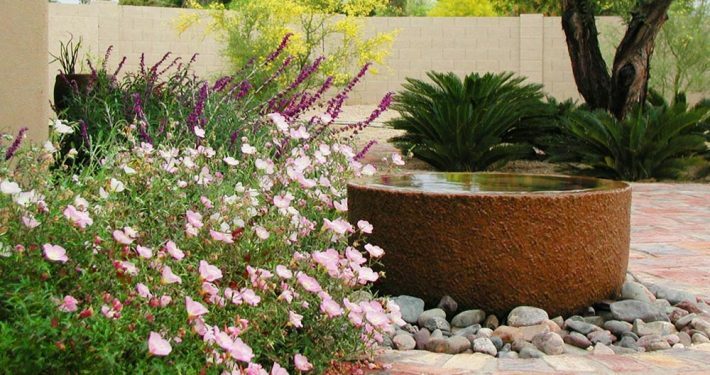 If you are searching for “backyard water fountains“, “outdoor water features“, “outdoor fountains“, “garden fountains“, “pondless water features“, “water fountains” or “water features” near me in Phoenix or Scottsdale, Arizona, Arte Verde can help! 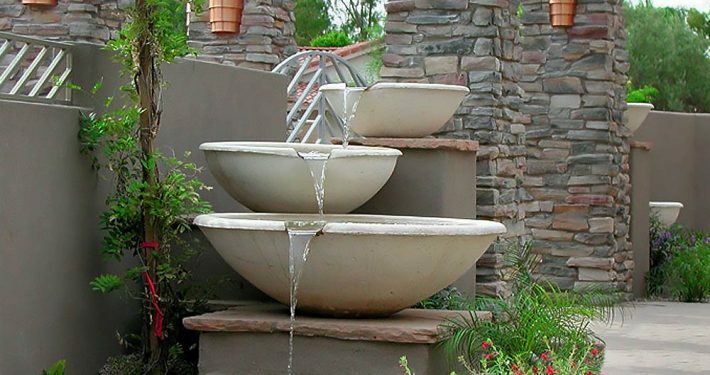 Arte Verde offers professional water feature and water fountain installation services. 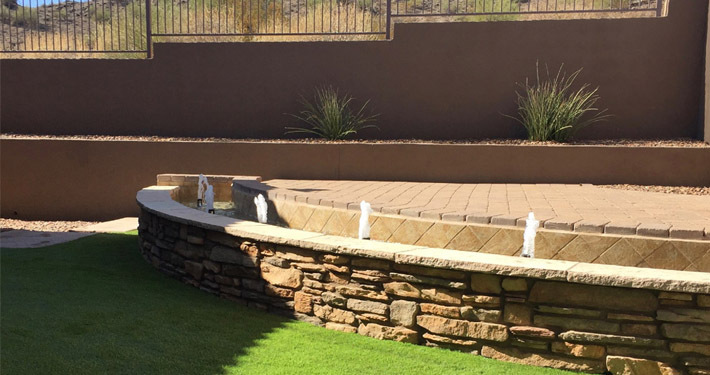 We are top Arizona backyard water feature installer! 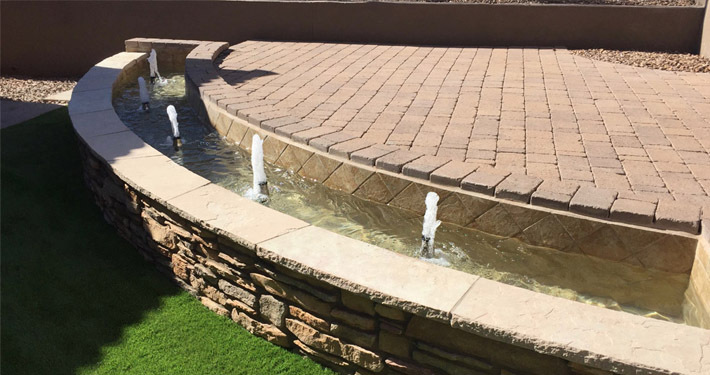 Give us a call today at (602) 618-0688 or get a custom water feature quote in Phoenix or Scottsdale. 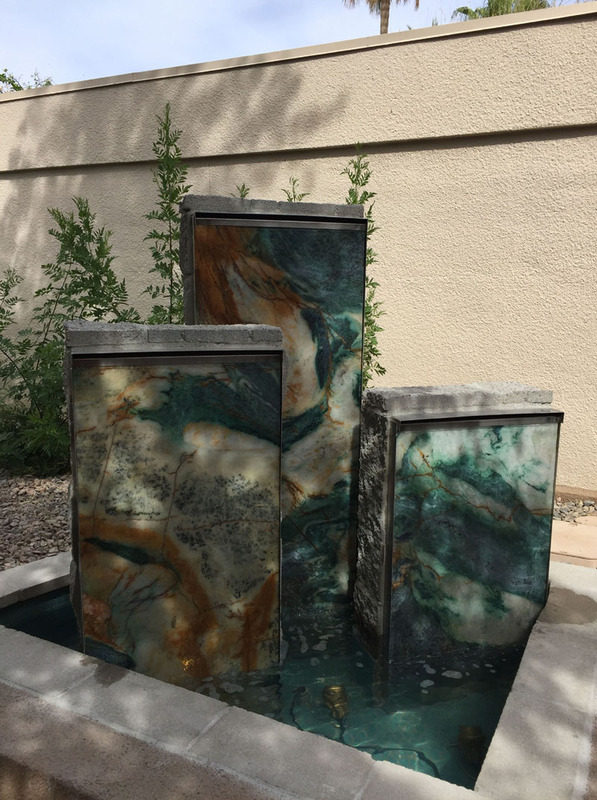 When designing garden retreats for Arizona homes, installing a custom water features such as a water fountain or koi pond brings many factors into play that are important to consider. The style of your home, desired location, sun exposure of the pool, access, and even the views from inside your home and sitting areas all need to be carefully considered. Creating the perfect ambiance for your home involves blending the desert’s natural landscape characteristics with your home’s unique architecture, and balancing them with you and your family’s individual wants and needs. Most customers choose backyard water features and water fountains to decorate their backyard landscape design. 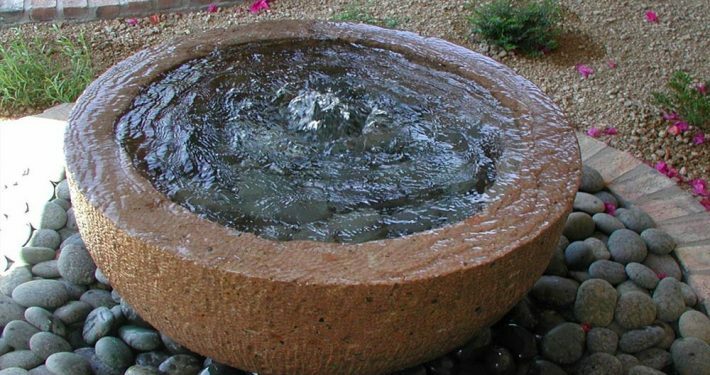 We can also design pondless water features like pondless water fountains and waterfalls. The perfect garden landscape incorporates elements that appeal to all of the five senses. Most Phoenix landscapes have vibrant plants that appeal to the eyes and offer fragrances that are a treat to smell. Some gardens even incorporate trees and plants that produce fruits and nuts to further add to the experience of their garden. Landscapes that include a water feature augment the outdoor environment with the soothing sounds of running water and wet stone textures. 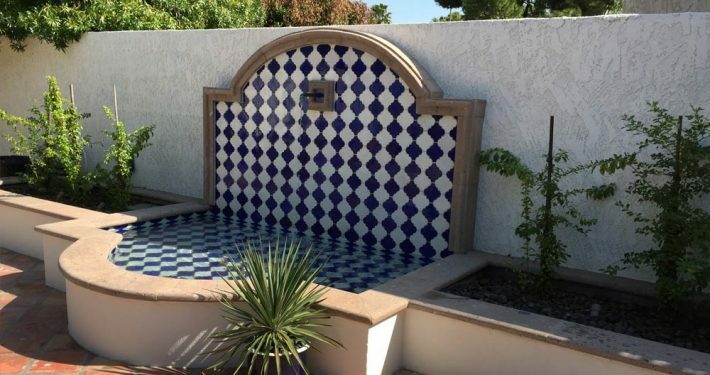 With custom water feature design & installation experience of Arte Verde, you will have a landscape that will be in harmony with it’s surroundings and entertain all of your senses. We are thrilled with the magnificent job Andy and ArteVerde did with our landscaping. I am impressed with the attention to detail and how Andy was there every step of the way to make sure everything was done right and in a timely manner. I highly recommend getting the “surface select” boulders as well as his lighting design. Truly artistic. Also, his choice of plants are both beautiful and low water usage. Andy went above and beyond to make sure the outcome was perfect. We decided to use Andy to redesign our yard because he truly thinks like an artist. He turned our yard into a beautiful desert landscape while keeping maintenance to a minimum and enhancing the beautiful plants with lighting and boulders. He was easy to work with and needed little guidance to achieve exactly what we envisioned. Andy also built a fire pit which again blends with the landscape, and turned out just as we wanted. He is easy to work with, dependable, and produces exactly what he promises. Andy has true passion for his work, which shines through in the results. Highly recommend! Andy/Arte Verde designed a lovely, natural desert landscape for our front and back yard. Two years later it is still beautiful and we get many compliments about how artistic it is. We just started using their maintenance services and they are doing a nice job of keeping it neat. When we moved into our home, the first thing my husband wanted to do was have an outdoor kitchen built. After searching the internet, he reached out to Andy at Arte Verde Landscape Design. From our first meeting until the finished project we knew we had found the best of the best from design to installation of the outdoor kitchen and then a beautiful Koi Pond in our courtyard to repairing out irrigation lines and the outdoor lighting. Professional, courteous, detailed, creative….what more could we have asked for! Thank you Andy and Arte Verde Landscape Design! Andy and his team are extraordinary. I simply cannot say enough about Andy’s artistic vision, his service, his team’s courtesy and reliability, and his amazing attention to detail. From initial designs, through budget considerations, project planning, submitting plans to my HOA for approvals, execution, and timeline – Andy exceeded all of my expectations. I have owned eight homes and built four of them from the ground up. I have never had an experience with a contractor that went so smoothly. Simply stated, Andy does what he says he is going to do. If you want to transform your outdoor living space, make Arte Verde your first call. The work that Andy did for us was spectacular. We have a large property and the landscaping was overgrown, messy, and basically had no design. After interviewing Andy, and three other companies, I was optimistic that he would turn our messy yards into beautiful desert gardens. He was there for every step, making sure that things got done right and in a timely manner. We are thrilled with the outcome! I particularly like his use of lighting and highly recommend the “surface select boulders” that added a lot of interest to different areas of the landscape. Everything is just beautiful with hummingbird flower gardens, and landscaping design that enhanced our pool. Andy’s attention to detail is what impressed me the most. He truly is an artist. I definitely give Andy and Arte Verde five stars. I met Andy several years ago when looking for someone to remodel my back yard in McCormick Ranch. Andy and his team knocked it out of the park. We recently sold our home and I am 100% convinced that the Backyard work that Andy designed and implemented were a key point of the sale. When my wife and I moved into our new home, we called Andy and he helped us update the front yard lanscaping. Andy treated our “update” of our front yard with the same enthusiasm and attention to detail that he did our major backyard remodel of our old home. 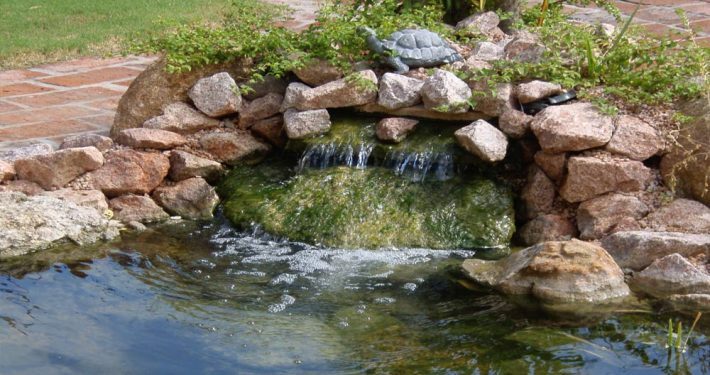 Whether it is in the form of a beautifully sculpted, pre-cast water fountain, a natural Koi pond or stream, adding water features transforms your outdoor property into a magical environment perfect for relaxation and meditation. The soothing white noise provided by your custom water fountain, stream or waterfall not only provides a personal garden oasis, but it also blocks the unwanted noise pollution of the surrounding area from impacting your environment. 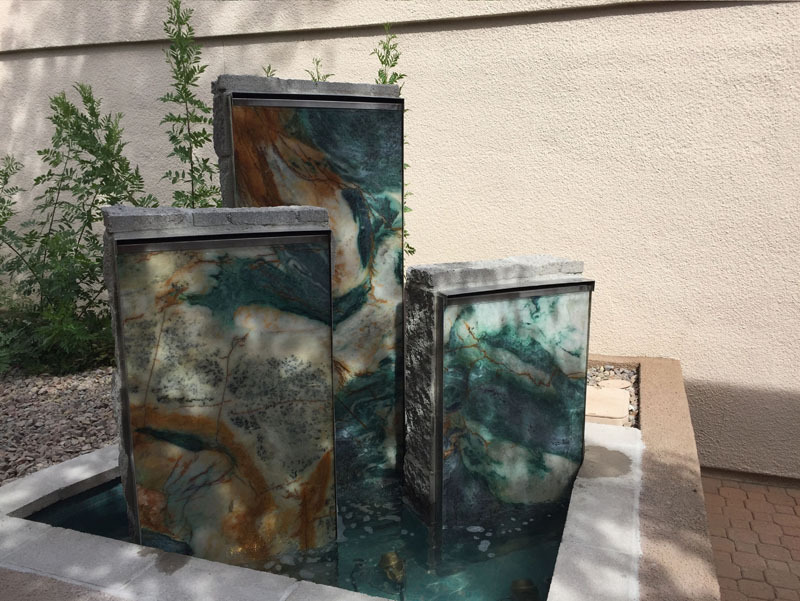 With Arte Verde’s installation of water features in Phoenix and the metro area, noises from the busy street, barking dogs, and loud air conditioners will fade into the background as you enjoy the serene atmosphere of your own personal paradise. WHAT ARE THE DIFFERENT TYPES OF WATER FEATURES YOU INSTALL? Water features range from small reflecting pools and ponds, to major waterfalls cascading into a Koi pond and commercial water fountains. 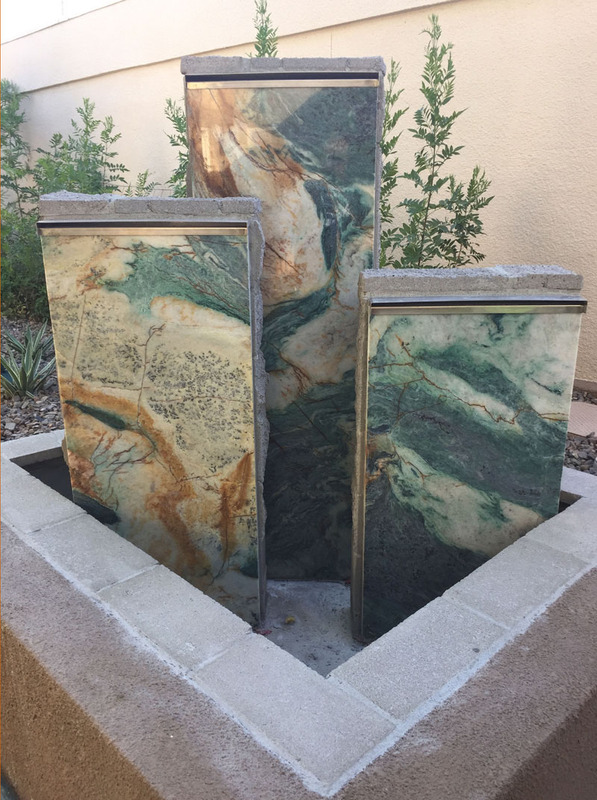 Your garden landscape will be far from ordinary with custom Phoenix water features or Garden Fountains installed by Arte Verde. You can choose from 4 different types of ponds including fish ponds, water gardens, ornamental pools and reflecting pools. A Fish pond or Koi pond is a very popular water feature in Arizona. Gold fish ponds are also very popular. Ornamental pools are also known as vertically cascading fountains, spouting statue or bell fountain. Reflecting pools are used as decorative feature for a garden or also used as a central feature. A water garden is a living water feature, complete with aquatic plants and full of vibrant color. Like water fountains, waterfalls can add vitality, motion and sound to your water feature. 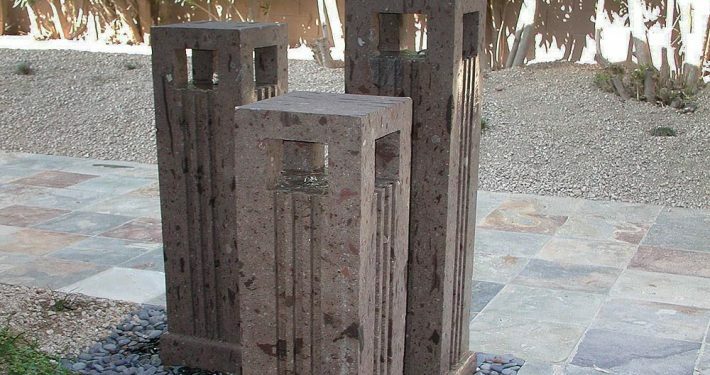 You have an endless variety of options when it comes to installing an outdoor water fountain. Streams are perfect along walkways, paths and even pool decks. A stream can act as a natural filter. How Much Electricity Does a Water Fountain Use? A small water fountain uses 44-watts of electricity to run the pump for 24 hours. How Much Does An Outdoor Water Fountain Cost to Build? According to HomeAdvisor, installing an outdoor water fountain in 2018 will cost an average of $2,603. Installing a small water fountain will cost you around $991. And, installing a large water fountain will cost upwards of $4,348. How Do Outdoor Water Fountains Work? An outdoor fountain work by either spraying water in the air or creating a waterfall effect. There is usually a water reservoir where the water is drawn from and returned to. Your water pump draws the water in from the reservoir and forces it out using centrifugal force. The fountain head either sprays the water into the air or allows it to flow down the outside of the fountain. 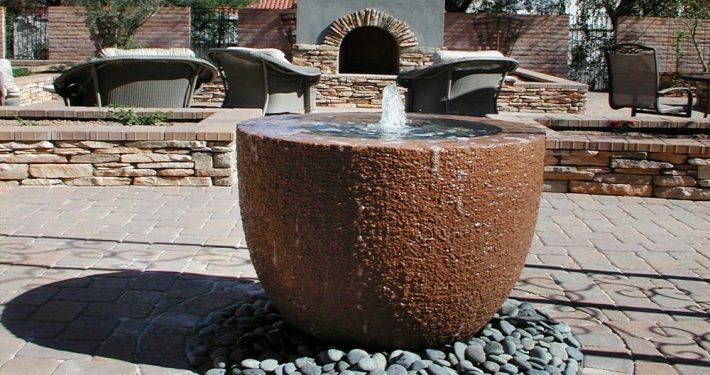 Bubbling water features and sounds soothe the senses in your own backyard. Contact us today to learn more! Arte Verde adds an artistic element to your landscape with truly unique water features and innovative ideas. Contact us today! 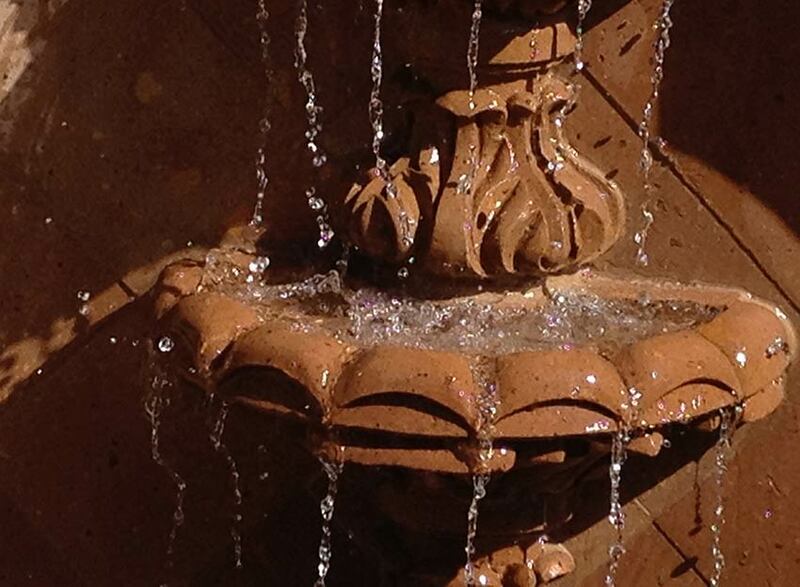 The ambient sound of trickling water fountains always appeal to the eyes and ears in your garden oasis. Contact us today! Sounds of water flowing in your backyard always washes away the stress of the day. Contact us today to learn more! Rich floral blossoms and sparkling water features help in tantalizing your strongest senses. Contact us today to learn more! The soothing sounds of running water masks the intrusion of unwanted and offensive noises. Contact us today to learn more! Enhance your living landscape with the sights and sounds of elegant ponds and flowing streams. Contact us today! 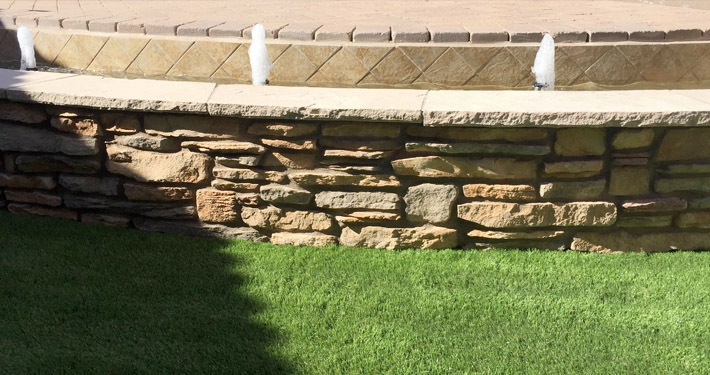 Combine hard, soft, and wet textures in your landscapes with the attractive appearance of stone fountains. Contact us today! 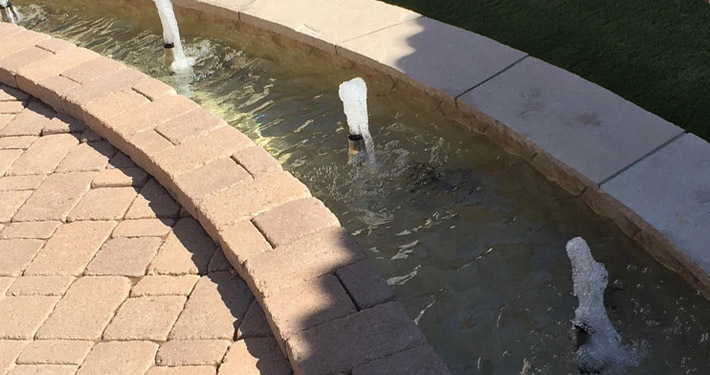 Give us a call today at (602) 618-0688 or get a free water feature quote in Phoenix or Scottsdale. 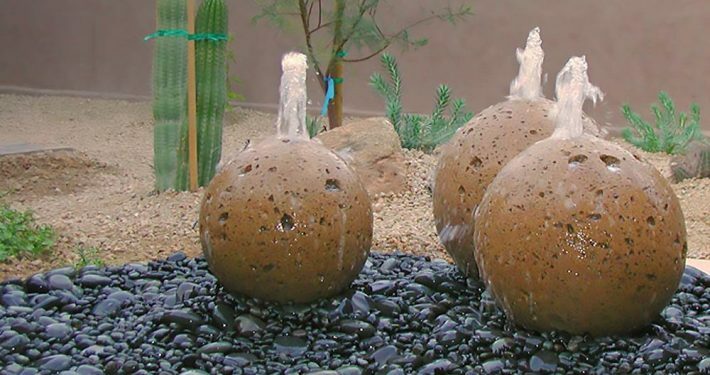 If you are searching for "backyard water fountains", "outdoor water features", "outdoor fountains", "garden fountains", "pondless water features", "water fountains" or "water features" near me in Phoenix or Scottsdale, Arizona, Arte Verde can help!